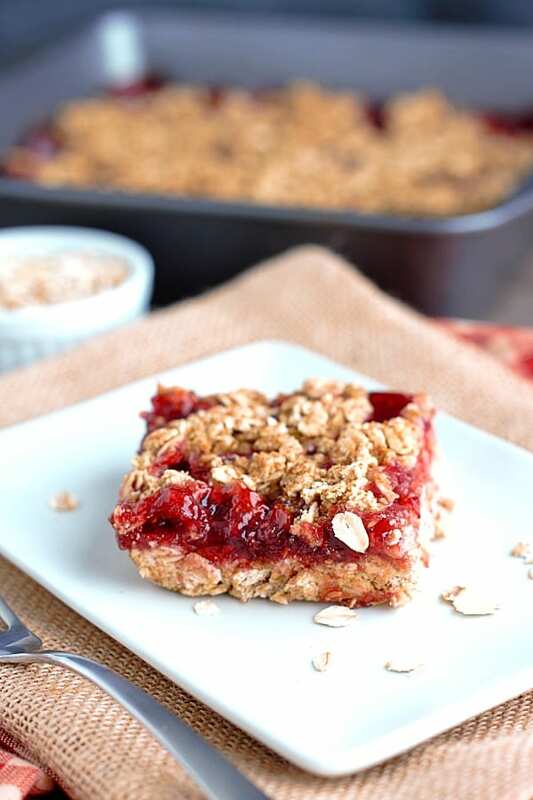 There’s nothing quite like delicious baked oatmeal bars with a fruity spread on top. Not to mention the way it fills your house with a sweet fruity aroma while baking. Oatmeal is super filling, but sometimes you don’t have the time to sit down and make a bowl, and the instant oatmeal packs are usually filled with processed sugar, fat, and scary additives. These all natural bars will fill you up with all natural goodness! 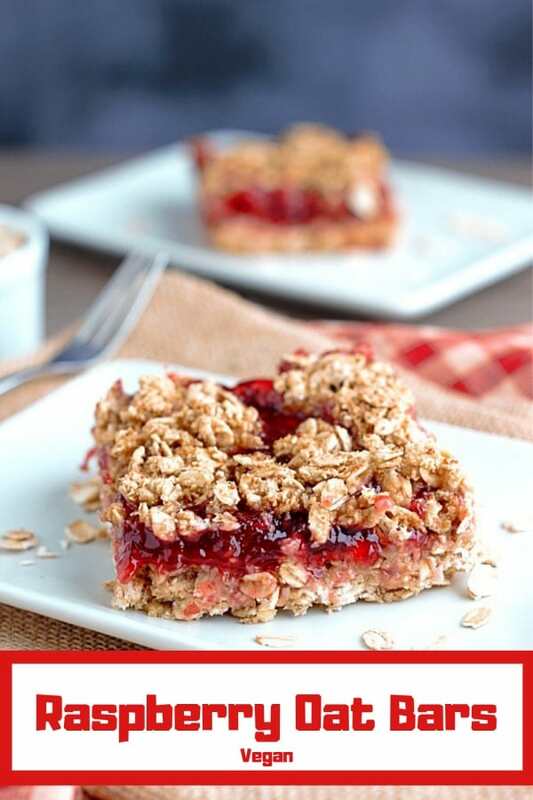 These on-the-go raspberry oat bars are the ideal weekday breakfast – just make a batch or two on Sunday night and enjoy it all week long (experiment with different fruit spreads to switch it up too)! 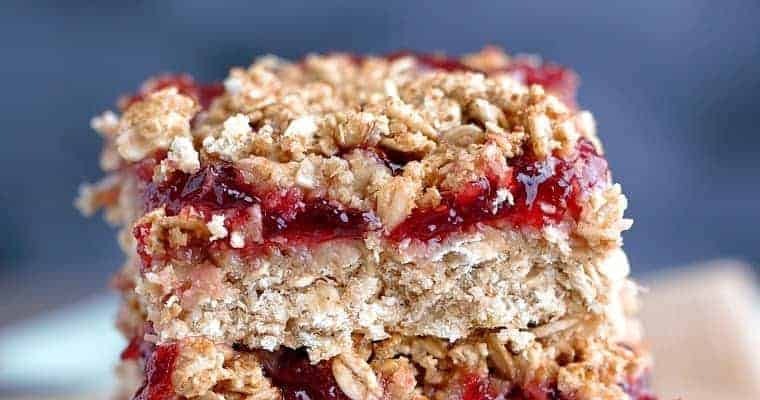 While I usually choose chocolaty over fruity, these oatmeal bars are absolutely incredible – the raspberry and oat combo is a match made in heaven! I’ve been on a (vegan) fig newton-type craze lately, which inspired me to make a more healthy fruity baked treat. 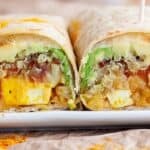 These did not disappoint and are even better and healthier! 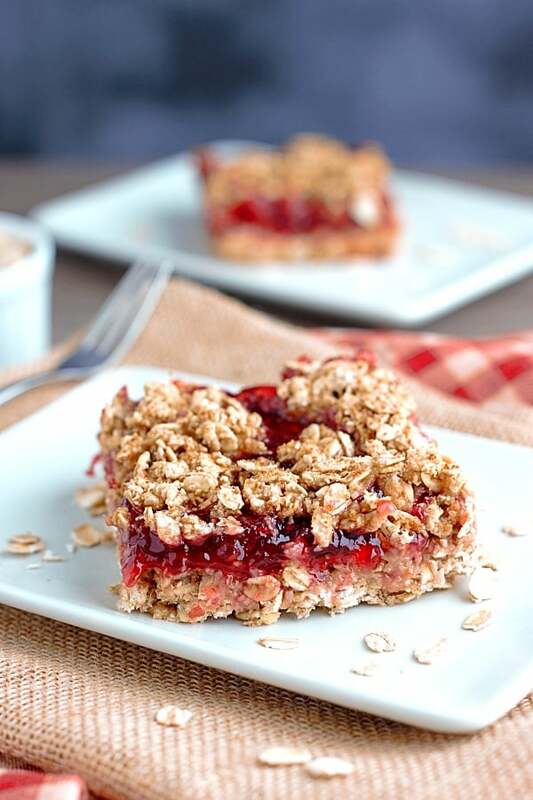 The key to making a great oat bar is the whole oat/ oat flour combo – it makes the texture more hearty and interesting. To make the base, place half your oats (1 1/2 cups) into a coffee grinder or blender, and process until they become a flour-like consistency. Add this, the whole oats, coconut sugar, baking powder and salt to a bowl and mix well. In another bowl place the 1/2 banana inside and squish with a fork until all the moisture is released and there are no chunks left. To this, add the syrup and vanilla and combine. Add these wet ingredients into the dry and mix well. Grab your 8×8 baking dish (I recommend lightly oiling the inside of the dish to ensure they won’t stick), and squish down the oatmeal mixture evenly, reserving about 1/2 cup for the topping. Now scoop in your fruit spread and evenly distribute it. Take your remaining oatmeal mixture and crumble it over the top, lightly pressing it down so it cooks evenly. At this point, I brushed on a tiny bit of oil, and some raw sugar. This step is optional, but it gives the top a nicer crunch, light brown color, and the raw sugar gives it more flavor (and… it’s pretty). Bake for about 25-30 minutes or until a light golden brown color. Make sure you let them cool completely before cutting and digging in so they retain their shape! Oats are one of the cheapest things you can buy, especially in bulk, and you probably have the other ingredients already in your kitchen. Add a couple dollars for the fruit spread (or make your own!) 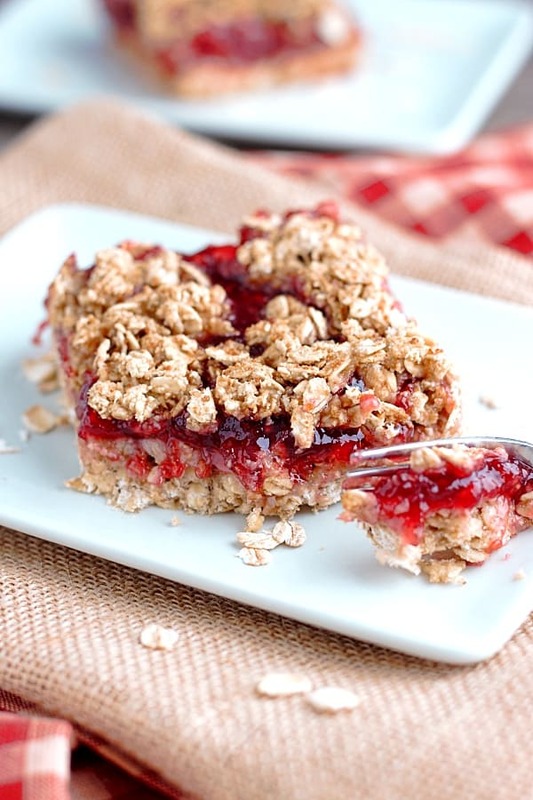 and you have a ridiculously budget-friendly breakfast or dessert! 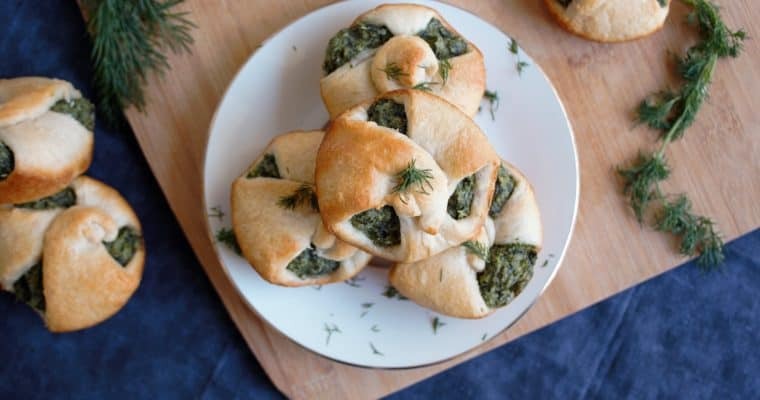 They are also super aesthetic and you could easily take these to a potluck, on a hike, or bake them in a pinch for brunch with friends! If you’re looking for more sweet treats, try my Vegan Vanilla Cupcakes or Vegan Blueberry Cheesecake! Grind 1 1/2 cups of the rolled oats into a flour using a coffee grinder (or just substitute regular flour here). Add rolled oats, ground oats, baking powder, coconut sugar and salt in one bowl and mix well. Add wet ingredients to dry and mix until everything is combined well. Add mixture (but set aside 1/2 cup for topping) to a oiled or non-stick 8x8 baking dish and squish down evenly. 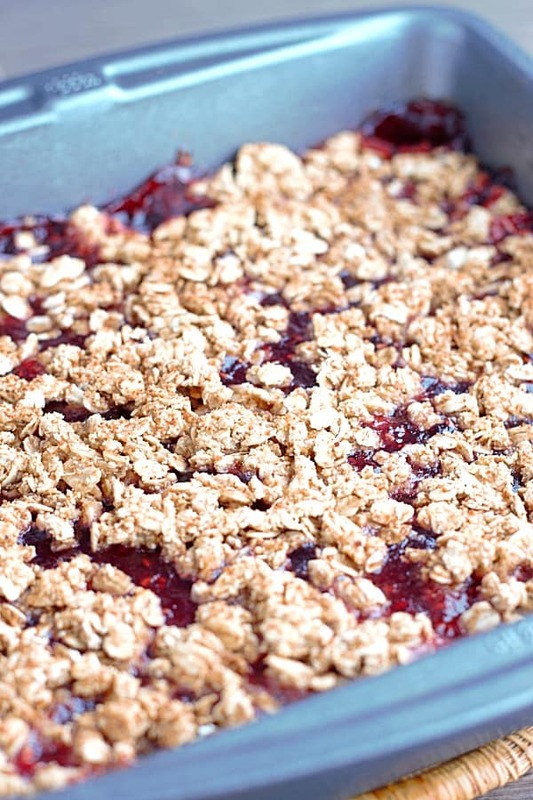 Add fruit spread in an even layer, then crumble on remaining oat mixture. If you want the top layer to be a bit crunchier and more flavorful, brush on a bit of oil and coconut sugar or raw sugar. Bake for 25-30 minutes, or until the top begins to brown and the fruit spread is all bubble. 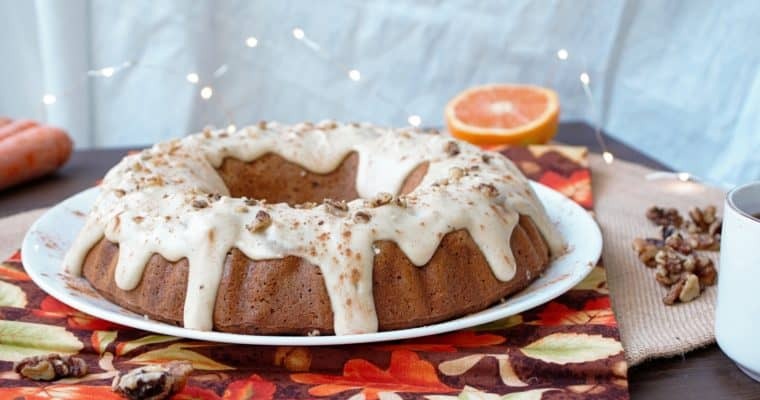 Allow to cool completely before cutting into, and enjoy! Crazy how simple treats like these are! 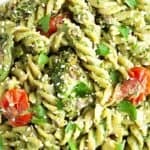 I love how healthy but delicious it is, has my mouth watering! I am so much fan of easy bar recipes that are sweet. 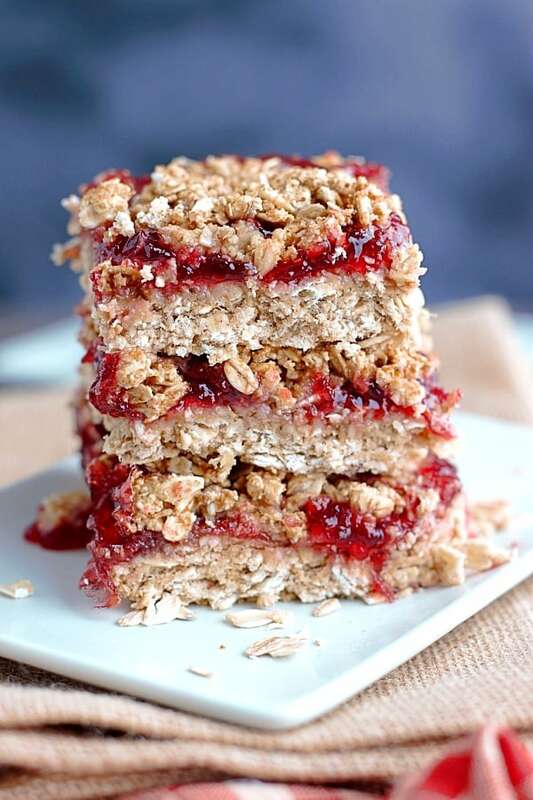 We love to start our mornings with sweet something and your oats bars are a perfect fit. We do too! 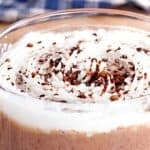 Bar recipes are great and they make enough to share! These bars are simply irresistible! My family ate them up in no time. Thanks so much! 🙂 I’m glad you liked them! 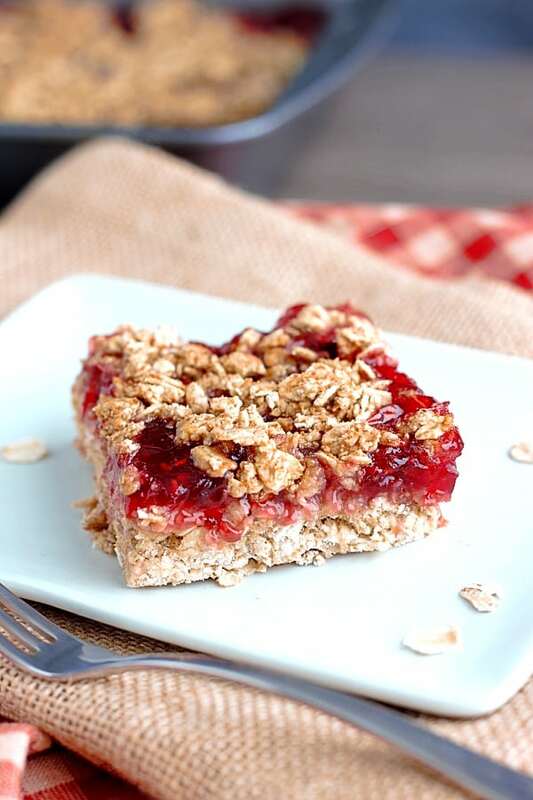 I love easy-to-make treats like these oat bars. Plus these are also budget-friendly! Yes! I always love simple and cheap treats! My local coffee shop does something similar to this. 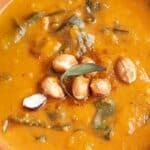 I am going to have to give this recipe a try and hope it compares.